There was a settlement of some kind at Ashton long before the Norman Conquest of 1066. A small hillock on the north bank of the River Tame, overlooking a good crossing-point on the river, became a fortified position guarding the boundary between the ancient kingdoms of Northumbria and Mercia. 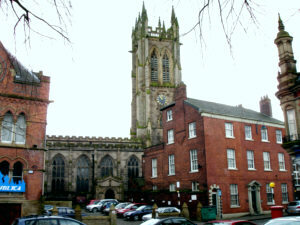 The parish church of St Michael and All Angels, Ashton under Lyne. A village developed just to the north of this, around the area where St Michael's Square is today. The fortification eventually became the Old Hall. A church was built and a market developed which served the surrounding areas. Rycroft Mill, in Ashton's West End, built in 1837. 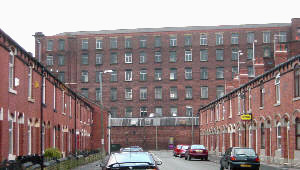 The town expanded rapidly during the Victorian period with many rows of red brick terraced houses being built to house the influx of workers for the cotton mills. The town's location next to the new M60 motorway will help to ensure a promising future. Visit the Local History index page to find out about more about particular places and events.